Every one of the seven early land plants hitherto discovered in the Lower Devonian chert from Rhynie, Scotland, is characterized by at least one unique feature. 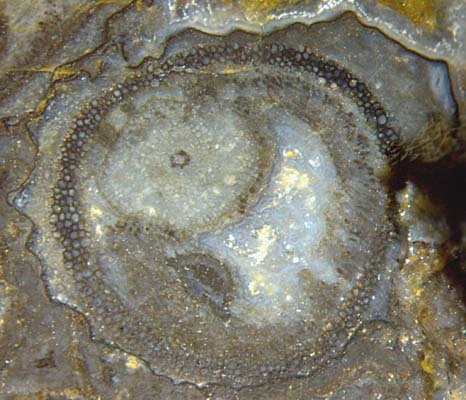 Plant cross-sections with a dark concentric ring at some distance from the periphery and consisting of rot-resistant cell walls are characteristic of the lately discovered Ventarura . The ring seen on cross-sections is, of course, a tube inside the stem. Unfortunately, reality is not as simple as this: The characteristic feature may be a ring segment instead of a closed ring, it may be pale instead of dark, and it may be so close to the periphery that the whole can be mistaken for a hollow straw of the most abundant plant in the Rhynie chert, Aglaophyton. Resulting from a peculiar growth mode, the originally circular ring may have been compressed into a crescent shape while the stem cross-section remained circular. As an exceptional phenomenon, there can be two concentric rings. Also it must be kept in mind that the the ring or tube is there in the upper parts of the plant only, which means that the lower parts of Ventarura are not readily recognized as such. A few of the facts and difficulties mentioned here can be illustrated by means of Fig.1 with 4 cross-sections of starkly differing aspect. Fig.1 (far left): Ventarura with and without dark rings on cross-sections. Width of the picture 13.5mm. 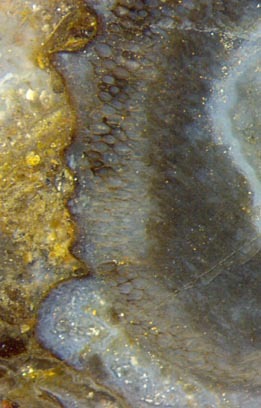 Fig.2: Degraded Ventarura, detail of cross-section on the right of Fig.1, (left to right): ruggedly shrunk and decayed outer cortex with a layer on the cuticle partially stained black, ring-shaped fraction of well-preserved cortex with cell walls partially stained black, degraded inner cortex, cavity lined with bluish chalzedony. The often conspicuous dark rings (or tubes in 3D) had been interpreted as sclerenchymatic tissue  but recently re-interpreted as a manifestation of an unexplained persistence of some fraction of middle cortex . 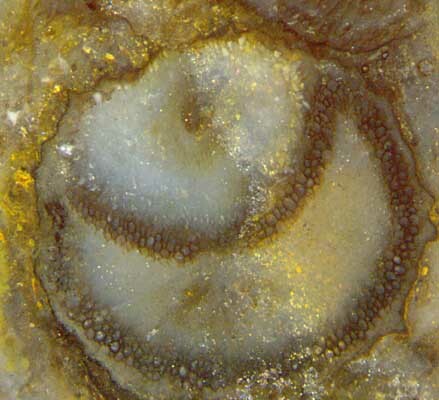 Although the aspect of the typical closed ring in the section on the left in Fig.1 is spoiled by a large dark inner cortex area of no relevance concerning the structure of the plant, the combination of dark ring and rugged outer boundary is strong evidence of Ventarura. By queer coincidence there is a conspicuous dark ring in the section on the right. It is confusing since it might be misinterpreted as evidence of Ventarura if looked at superficially. A closer look reveals that it is only dark inner cortex, likewise irrelevant as the dark area on the left of this image. There is evidence of Ventarura, though less conspicuous: The relevant ring is seen between the irrelevant dark inner cortex fraction and the shrunken outer cortex. This ring is partially dark or pale, as seen more clearly on the enlarged detail in Fig.2. Obviously the dark aspect of part of the ring is not brought about by thick-walled sclerenchyma cells but by some black deposit, probably of microbial origin, on the thin walls of rot-resistant cortex cells arranged as a ring. 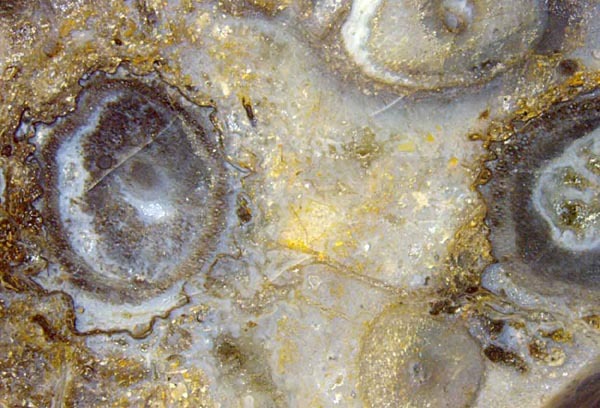 It has been shown that the black deposit had been only loosely connected to the cell wall and may have flaked off before silicification . The deposit is probably of the same type as often present on the cuticle, where it may cause the cuticle to peel off and form a curl . No explanation is proposed here concerning the origin and purpose of the persistent tissue shaped as a (partial) ring or tube. More questions arise from a peculiar growth mode whereby the ring or tube became deformed into a crescent shape (Figs.3,4). Figs.3,4: Cross-sections of Ventarura shoots with persistent rings squeezed into crescent shapes by another shoot grown inside later. Apparently a new shoot had grown inside the old one along the outer cortex, thereby pushing the old tissue aside so evenly that a new circular outline was formed. The old inner cortex was probably degrading by that time, offering virtually no resistance. Thus the persistent ring became crescent-shaped, which implies large deformation during the re-shaping process. This means that the ring must have been soft, which is another piece of evidence contradicting the sclerenchyma hypothesis. The growth of a new shoot inside the old one is more advanced in Fig.4 compared to Fig.3. The process can go so far that the old shoot degrades into a mere sheath around the new one. The formation of new shoots in old ones is not rare with the two zosterophylls Ventarura and Trichopherophyton. It is not known in which way this process begins. It may also begin in the inner cortex so that the persistent ring, if there is any, remains circular as in Fig.5. 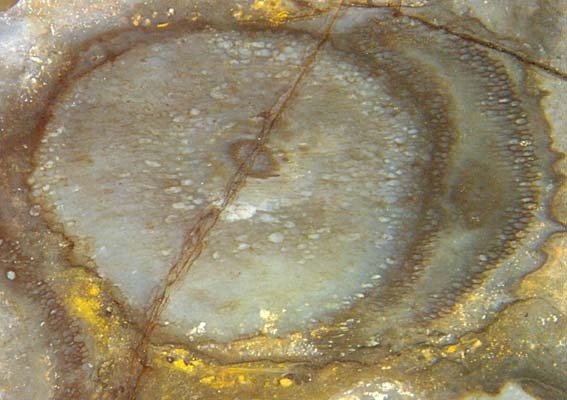 Fig.5: Cross-section of Ventarura with a small new shoot inside the persistent ring. Width of the picture 5.4mm. Among the cross-sections shown here, Fig.5 is the least confusing one. With the rugged outline resulting from shrunken and partially vanished outer cortex and the well preserved mid-cortex ring, the typical features of Ventarura are there. The outline is marked by a black deposit on the cuticle. Similar as in Fig.1, the ring is partially dark or pale. Silicification has preserved the central strand of irregular shape, a new shoot with own central strand and circular cross-section, and some remains of the degraded inner cortex. Again it is not known where the new shoot came from and where it would end. It has been proposed that new shoots seen inside old ones had grown along dead plant parts  but there are several pieces of contrary evidence. Hence it remains undecided how to interpret composite plant structures like those in Figs.3-5 and in Rhynie Chert News 16. H.-J. Weiss: Rhynie chert - Implications of new finds. EPPC 2014, Padua.